To reduce, deter, and prevent crime and disorder in our community. Enhance the partnership between the community and our department. Create a positive work environment in which our employees will flourish. Achieve higher efficiency by maximizing the use of our internal resources. Create a culture of accountability and self-discipline. Colonel John W. Hayden, Jr. joined the Metropolitan Police Department – City of St. Louis on February 23, 1987. He was appointed Police Commissioner on December 28, 2017. 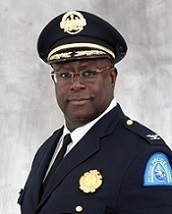 He is St. Louis City’s 35th Chief of Police. Colonel Hayden manages the second largest police department in the State of Missouri with an authorized strength of more than 1,300 sworn officers and over 400 civilian employees. Colonel Hayden is responsible for overseeing an annual budget of $170 million, a third of the city’s budget. Colonel Hayden’s 30-year career is well balanced with 15 years of investigative experience and 15 years of administrative assignments. He served as a Commander in the North Patrol Division from 2013 through 2017. His crime strategies resulted in significant crime reduction in several neighborhoods during his tenure. Prior to 2013, he served as the Commander of the Internal Affairs Division. In that capacity, Colonel Hayden oversaw more than 1200 investigations of employee misconduct. Throughout his career he has been passionate about the pursuit of excellence in policing. Colonel Hayden served as the Executive Aide to the Chief of Police from 2001 through 2007, managing the department from the executive level. He has extensive teaching experience from his time in the Police Academy, where he served as both an Instructor and Training Coordinator. While in the Police Academy, Colonel Hayden was responsible for teaching and developing training on a topic that is still his top priority – Ethics. Colonel Hayden was recognized for his exceptional performance with a Chief’s Letter of Commendation in 2007. Colonel Hayden has a Bachelor’s degree in Mathematics from Washington University where he played college football. He also has a Master’s degree in Management from Fontbonne University. He was accepted into St. Louis University’s prestigious School of Law and has completed over 50 credits in their Juris Doctorate Program. He has also completed 15 hours of graduate coursework in Theological Studies at the Covenant Theological Seminary. Colonel Hayden is a life member of Kappa Alpha Psi Fraternity, Inc. He is a member of the Police Executive Research Forum, the International Association of Chiefs of Police and the Major Cities Police Chiefs Association. He has served as a Deacon at Pleasant Green Missionary Baptist Church in St. Louis since 1998. Colonel Hayden is 55 years old and a lifelong resident of St. Louis City. He and his wife Michelle have been married for 28 years and have three daughters, Ashley, Kathryn and Kaylynn.